Physiotherapy also known as physical therapy, involves an interaction between patient and physiotherapist in order to access and diagnose the problem in the patient. Globally, expanding geriatric population across the world, higher prevalence and incidences of orthopedic disorders, growing women’s healthcare concern, and rise in the awareness among people regarding advantages of physiotherapy are the prime growth drivers of global physiotherapy services market. In addition, increase in adoption of physiotherapy services in emerging economies such as China, India and others, will create new opportunities for global physiotherapy services market. 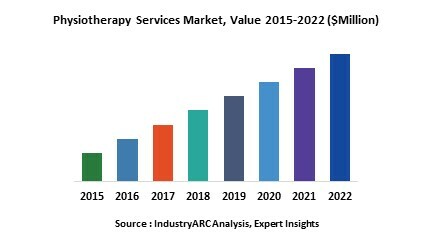 However, higher cost and maintenance of physiotherapy equipment, shortage of skilled physiotherapist, and increasing popularity of other services such as acupuncture are the key restraints for global physiotherapy services market. Geographically North America dominated global physiotherapy services market, because of increasing number of patients suffering from osteoporosis, rising geriatric population, and higher rate of road and workplace accidents. Asia Pacific is projected to have fastest growth, owing to rapidly increasing aging population, rise in consumer awareness, favorable government policies, modernization of healthcare infrastructure, and growing medical tourism industry in developing nations such as China, and India in this region. Among all the applications, orthopedics and geriatric physiotherapy services has the highest market share in global physiotherapy services market due to higher prevalence of geriatric population. Physiotherapy is provided to the patients suffering from disabilities and impairments of mobility by physiotherapist. In physical therapy, trained professionals evaluate and treat abnormal physical function related to, for example, an injury, disability, disease or condition. The American Physical Therapy Association (APTA) has defined , a physical therapist as a trained and licensed medical professional with experience in diagnosing physical abnormalities, restoring physical function and mobility, maintaining physical function, and promoting physical activity and proper function. Licensed physiotherapists can be reached in a range of healthcare settings including outpatient offices, private practices, hospitals, rehab centers, nursing homes, home health, sports and fitness settings, schools, hospices, occupational settings, government agencies, and research centers. What are the major applications for Physiotherapy services? Physiotherapy is used to treat a wide variety of medical conditions, depending on their specialty. Exercises recommended in Physiotherapy yield multiple benefits by exercising the whole body overall, it is nothing but moving the muscles of your body at different angles thereby maintaining the blood circulation and keeping flexibility alive. With increasing age, our body often falls victim to neurological disorders like Parkinson’s disease, Chronic Fatigue, Dementia, Paralysis etc, Physiotherapy helps in coping such disorders and prevents any further deterioration because physiotherapy takes an integrated musculoskeletal and neuromuscular approach to the treatment of the problem. Physiotherapy started from simple massage and is nowadays available in wide range of therapies with many specialized applications. In the past, physiotherapists were not always recognized as a contributing member of a hospital care team. Therapy plans were developed and administered later in the cycle of care. Modifications in rules, mainly driven by the Affordable Care Act, have given Physical Therapists their rightful role as an influential member of the care team. Nowadays has become widely accepted as a treatment therapy after any major/minor accident or even after recovery for ill health. They help in limiting assistance from devices like crutches, braces, canes, splints etc. Typically it costs about 300-400 USD for such a treatment. With the growing geriatric population number of accidents such as elderly falls in household and outdoors will rise also the malfunctioning of joints has become common these days, will rise further which would lead to an obvious surge in the need for physiotherapists and advanced techniques like aquatic therapy designed for patients with low pain tolerance . The accidents may be due to natural cause such as calamities or due to personal mistakes of individuals or groups. Performance of hospitals these days is evaluated on basis of patient readmission rates, and physiotherapists are finally being recognized as key contributors to the care transition process from hospital to outpatient or home services. Physiotherapists are involved in preparing patients for transition and are being relied upon to provide input and strategies for how physical therapy can help reduce avoidable 30-day readmission rates. The progress in preventive techniques like yoga and preventive medicine is expected to be a growth restraint for these services. There are surgeries for same complete replacement of malfunctioning part also. Direct access and autonomous practice of physical therapy is not as simple but the interface between patient and physiotherapist is expected to become more simpler by the implication of technology such as mobile applications suggesting exercises and alarming on the right times to perform them. Other health services will also prosper so there is expected to be a competition among physiotherapists and other health professionals. But the advent of methods like hydrotherapy and electrotherapy would pose a serious competition.There is not much development at present in measurement of degree of treatment of physiotherapy but growing modernization will ultimately lead to measurable outcomes for these treatments also. Equipment for tilting , bending, stretching ,etc. is already available to assist physiotherapists. Physiotherapists are naturally a creative and resourceful group of care providers, so it is no surprise that many are now incorporating the use of video games aided by virtual reality (VR) into their treatment plans. Implication of techniques by using platforms such as the Nintendo Wii, allows therapists to take advantage of the motion-sensitive controllers to drive patients to perform targeted movements. Wii-Hab approach is proving to be a way to engage patients in actively participating in their recovery and allow treatment to expand beyond the clinical setting. Patients who enjoy the process of recovery are more likely to stick to it. Who are the Major Players in Physiotherapy Services market?